The properties of water vapor have been studied. 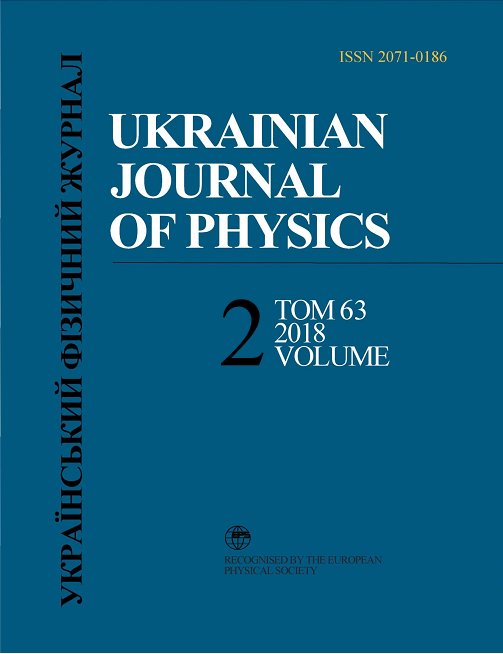 The main attention is focused on the physical nature of the effective polarizability of water vapor and the heat capacity of water vapor at a constant volume, with a proper modeling of those parameters being a good test for a correct description of the dimer concentration in various approaches. Thermal vibrations of water dimers are found to be the main factor governing the specific temperature dependences of those characteristics, and the normal coordinates of dimer vibrations are determined. Fluctuations of the dipole moments of dimers and their contribution to the dielectric permittivity of water vapor are considered in detail. The contribution of the interparticle interaction to the heat capacity is taken into account. By analyzing the effective polarizability and the heat capacity, the temperature dependence of the dimer concentration at the vapor-liquid coexistence curve is determined. The noticeable dimerization in saturated water vapor takes place only at temperatures T/Tc > 0.8, where Tc is the critical temperature. D. Eisenberg, V. Kauzmann. The Structure and Properties of Water (Oxford Univ. Press, 1969). K. Burrows, E.R. Pike, J.M. Vaughan. Light-scattering experiments on water vapour at pressures approaching saturation. Nature 260, 131 (1976). G.E. Ashwell, P.A. Eggett, R. Emery, H.A. Gebbie. Molecular complexity of water vapour and the speed of sound. Nature 247, 196 (1974). L. A. Curtiss, D. J. Frurip, M. J. Blander. Studies of molecular association in H2O and D2O vapors by measurement of thermal conductivity. Chem. Phys. 71, 2703 (1979). R.A. Bohlander, H.A. Gebbie, G.W.F. Pardoe. Absorption spectrum of water vapor in the region of 23 cm?1 at low temperatures. Nature 228, 156 (1970). J. Hargrove. Water dimer absorption of visible light. Atmos. Chem. Phys. Discuss. 7, 11123 (2007). A.J.L. Shillings, S.M. Ball, M.J. Barber, J. Tennyson, R.L. Jones. An upper limit for water dimer absorption in the 750 nm spectral region and a revised water line list. Atmos. Chem. Phys. 11, 4273 (2011). A.A. Vigasin. Water vapor continuous absorption in various mixtures: possible role of weakly bound complexes. J. Quant. Spectr. Rad. Transf. 64, 25 (2000). A.A. Vigasin, A.I. Pavlyuchko, Y. Jin, S. Ikawa. Density evolution of absorption bandshapes in the water vapor OH-stretching fundamental and overtone: evidence for molecular aggregation. J. Mol. Str. 742, 173 (2005). C.J. Leforestier.Water dimer equilibrium constant calculation: A quantum formulation including metastable states. Chem. Phys. 140, 074106 (2014). J.O. Hirschfelder, F.T. McClure, I.F. Weeks. Second virial coefficients and the forces between complex molecules. J. Chem. Phys. 10, 201 (1942). D. Stogrynt, J.O. Hirschfelder. Contribution of bound, metastable, and free molecules to the second virial coefficient and some properties of double molecules. J. Chem. Phys. 31, 6, 1531 (1959). G. N.I. Clark, D.C. Christopher, J.D. Smith, R.J. Saykally. The structure of ambient water. Mol. Phys. 108, 1415 (2010). Y. Scribano, N. Goldman, R.J. Saykally. Water dimers in the atmosphere III: Equilibrium constant from a flexible potential. J. Phys. Chem. A 110, 5411 (2006). N.P. Malomuzh, V.N. Makhlaichuk, S.V. Hrapatiy. Water dimer dipole moment. Russ. J. Phys. Chem. A 88, 1431 (2014). J.R. Reimers, R.O. Watts. The structure and vibrational spectra of small clusters of water molecules. Chem. Phys. 85, 83 (1984). H.J.C. Berendsen, J.P.M. Postma, W.F. van Gunsteren, J. Hermans. In Intermolecular Forces. Edited by B. Pullman (Reidel, 1981), p. XXXXXX. M.J. Smit, G.C. Groenenboom, P.E.S.Wormer, Ad van der Avoird, R. Bukowski, K. Szalewicz. Vibrations, tunneling, and transition dipole moments in the water dimer. J. Phys. Chem. A 105, 6212 (2001). H. Fr?ohlich. Theory of Dielectrics: Dielectric Constant and Dielectric Loss (Clarendon, 1958). V.L. Kulinskii, N.P. Malomuzh. Dipole fluid as a basic model for the equation of state of ionic liquids in the vicinity of their critical point. Phys. Rev. E 67, 011501 (2003). D.P. Fernandez, Y. Mulev, A.R.H. Goodwin, J.M.H. Levelt Sengers. A database for the static dielectric constant of water and steam. J. Phys. Chem. Ref. Data 24, 133 (1995). N.P. Malomuzh, V.N. Mahlaichuk, S.V. Hrapatiy. Water dimer equilibrium constant of saturated vapor. Russ. J. Phys. Chem. A 88, 1287 (2014). N.P. Malomuzh, V.N. Makhlaichuk, P.V. Makhlaichuk, K.N. Pankratov. Cluster structure of water in accordance with the data on dielectric permittivity and heat capacity. J. Struct. Chem. 54, 205 (2013). A.I. Fisenko, N.P. Malomuzh, A.V. Oleynik. To what extent are thermodynamic properties of water argon-like? Chem. Phys. Lett. 450, 297 (2008). L.A. Bulavin, A.I. Fisenko, N.P. Malomuzh. Surprising properties of the kinematic shear viscosity of water. Chem. Phys. Lett. 453, 183 (2008). L.A. Bulavin, T.V. Lokotosh, N.P. Malomuzh. Role of the collective self-diffusion in water and other liquids. J. Mol. Liq. 137, 1 (2008). E.W. Lemmon, M.O. McLinden, D.G. Friend. Thermophysical properties of fluid systems. In NIST Chemistry WebBook, NIST Standard Reference Database Number 69. Edited by P.J. Linstrom and W.G. Mallard (National Institute of Standards and Technology, XXXX). L.D. Landau, E.M. Lifshitz. Statistical Physics (Pergamon, 1980). M.V. Timofeev. Simulation of the interaction potential between water molecules. Ukr. J. Phys. 61, 893 (2016). J.O. Hirschfelder, Ch.F. Curtiss, R.B. Bird. Molecular Theory of Gases and Liquids (Wiley, 1954). S.V. Lishchuk, N.P. Malomuzh, P.V. Mahlaichuk. Why thermodynamic properties of normal and heavy water are similar to those of argon-like liquids? Phys. Lett. A 374, 2084 (2010). A.H. Harvey, E.W. Lemmon. Correlation for the second virial coefficient of water. J. Phys. Chem. Ref. Data 33, 369 (2004). G.T. Evans, V. Vaida. Aggregation of water molecules: Atmospheric implications. J. Chem. Phys. 113, 6652 (2000). Y. Scribano, N. Goldman, R.J. Saykally, C. Leforestier. Water dimers in the atmosphere III: Equilibrium constant from a flexible potential. J. Phys. Chem. A 110, 5411 (2006). M.Yu. Tretyakov, D.S. Makarov. Some consequences of high temperature water vapor spectroscopy: Water dimer at equilibrium. J. Chem. Phys. 134, 084306 (2011). Moscow Power Engineering Institute, Mathcad Calculation Server. N.D. Sokolov. Hydrogen bond. Usp. Fiz. Nauk 57, 205 (1955) (in Russian). W.L.J. Jorgensen. Quantum and statistical mechanical studies of liquids. 10. Transferable intermolecular potential functions for water, alcohols, and ethers. Application to liquid water. Am. Chem. Soc. 103, 335 (1981). M.D. Dolgushin, V.M. Pinchuk. Theoretical study of the nature of a hydrogen bond by means of comparative calculations. Preprint ITP-76-49R (Inst. for Theor. Phys. of the NASU, 1976) (in Russian). I.V. Zhyganiuk, M.P. Malomuzh. Physical nature of hydrogen bond. Ukr. J. Phys. 60, 960 (2015). P.V. Makhlaichuk, M.P. Malomuzh, I.V. Zhyganiuk. Potential in the multipole approximation. Ukr. J. Phys. 58, 278 (2013). R.C. Dougherty, L.N. Howard. Equilibrium structural model of liquid water: Evidence from heat capacity, spectra, density, and other properties. J. Chem. Phys. 109, 7379 (1998). National Institute of Standards and Technology, A gateway to the data collections [http://webbook.nist.gov]. P.V. Makhlaichuk, V.N. Makhlaichuk, N.P. Malomuzh. Nature of the kinematic shear viscosity of low-molecular liquids with averaged potential of Lennard-Jones type. J. Mol. Liq. 225, 577 (2017).